Abandon Fear » Blog Archive » Sharkwater screening and fundraiser in Japan! Tokyo, Japan (July, 09) – PangeaSeed, a Japan-based nonprofit organization, is ramping up its inaugural activities in Tokyo this summer with events tailored to spotlight the organization’s dedication to increasing awareness of the plight of sharks. Of the 400 shark species, more than 100 are endangered, with many species so overexploited it may be impossible for them to recover. The events will showcase the issues surrounding shark finning in Asia and other parts of the world, where sharks are killed to satisfy culinary and medicinal demand. In finning it is common to cut the fin from a still-living shark, then discard the rest, as the fin is worth many times over the shark as a whole. PangeaSeed takes an inclusive approach to spreading its message by engaging its audience through music, art, photography and open discussion. First, PangeaSeed has been selected to host a booth at the 2009 Fuji Rock Festival’s NGO Village on July 24 -26, 2009. The booth will feature information and facts about the shark finning issue and aims to provide a venue for the organization to educate and discuss with its target audience such topics as the threat of shark extinction, and the need for shark protection and shark sustainability. At the event, PangeaSeed will collect signatures with the goal of securing an area of the coast of Miyagi prefecture as a sanctuary for sharks, while special guest artist and PangeaSeed member Yoh Nagao will perform “live paints” during the festival to raise awareness of the shark finning issue. During the festival, PangeaSeed also will feature a public service announcement on the festival’s Green Stage. 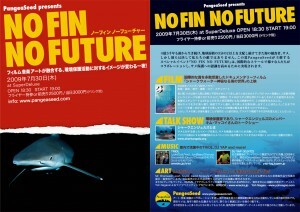 Later in July, PangeaSeed will host its first event, “No Fin, No Future.” The event will be held Thursday, July 30, 2009, at Super Deluxe in Nishi Azabu, and will feature never-before-seen art and photography from global artists such as Mr. Brainwash, Josh Keyes, Dave Kinsey and many more. Guests will enjoy a screening of the international award-winning documentary, “Sharkwater” followed by a discussion with leading shark expert, Ms. Kim McCoy of Shark Angels. Ms. McCoy will discuss her experience in working with sharks including research and education. She will also share with the audience underwater footage of swimming and interacting with large sharks from around the world. “We are very excited to showcase a not-for-profit fund raising art collection featuring works contributed from more than 30 internationally renowned artists, graphic designers and photographers never seen before in Japan,” said Tre’ L. Packard, managing director of PangeaSeed. About PangeaSeed: PangeaSeed (www.pangeaseed.com) is a Tokyo-based grassroots effort to educate and raise awareness of the plight of sharks around the world. Through volunteer activism and the media of art, music and photography, PangeaSeed aims to create an open dialogue with the global community to develop an understanding of the need to preserve and protect sharks and their habitat. This entry was posted on Monday, July 20th, 2009 at 1:21 pm	and is filed under Uncategorized. You can follow any responses to this entry through the RSS 2.0 feed. You can leave a response, or trackback from your own site. I have just watched the film and I am really impressed. It is a wonderful job. By the way I am living in Japan and yesterday I knew that the film will be broadcast here on September 18th, on WOWOW channel. I watched your “Sharkwater” documentary last year and was so angry as well as inspired. Born in Hong Kong, I’ve had my fair share of shark fin soups. I never quite understood the significance of those tasteless cartilage or why we “have to” eat them in every semi-special occasion in Hong Kong. Your film made me feel so ashamed of this irresponsible Hong Kong/Chinese custom. To be fair, there are just so many Chinese in the world, whichever wildlife species we choose to eat, they will extinct sooner or later. But now that there is considerable evidence for the cruelty involved and the ecological damages shark finning is causing, we Chinese have no excuse to continue. Last time I talked to my friends in Hong Kong on the subject, some merely noted that the “free market will take care of itself” (yes, that was last year), or that sharks don’t look as cute as panda and it’d be hard to make people care. But I also know people who have stopped eating shark fin soup for years or have refused to serve it at their own wedding. Change is coming. I hope we still have time. As a token of appreciation for your work on saving sharks, I made a shark costume to raise awareness within my circle at Halloween last year in Missouri. I can’t tell you what kind of shark it’s supposed to be, but all its fins have been chopped off, dangling off the body with blood coming out everywhere. Needless to say, I got lots of attention and all my friends now acknowledge the urgency of saving these incredible animals. I just wish I can do the same thing back in Hong Kong too. Anyways. Keep up the good work. Best of luck with your next film. Hi my name is Niklas I just saw the movie that you made, keep up the good work! I work as a coast guard officer in Sweden and I was ashamed of what my colleges in other countries were doing, to stop you from doing what we should be doing.